Pedro Fernandes de Queirós, another Portuguese navigator sailing for the Spanish Crown, saw a large island south of New Guinea in 1606, which he named La Austrialia del Espiritu Santo. He represented this to the King of Spain as the Terra Australis incognita. In his 10th Memorial (1610), Queirós said: "New Guinea is the top end of the Austral Land of which I treat [discuss], and that people, and customs, with all the rest referred to, resemble them". ^ Eisler, William (1995). 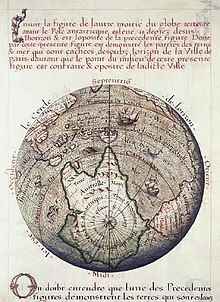 The Furthest Shore: Images of Terra Australis from the Middle Ages to Captain Cook. Cambridge University Press. p. 10. ISBN 0-521-39268-3. Pedro Fernandes de Queirós (1563–1614) was a Portuguese navigator in the service of Spain best known for his involvement with Spanish voyages of discovery in the Pacific Ocean, in particular the 1595–1596 voyage of Alvaro de Mendaña de Neira, and for leading a 1605–1606 expedition which crossed the Pacific in search of Terra Australis. Dirk Hartog was a 17th-century Dutch sailor and explorer. Dirk Hartog's expedition was the second European group to land in Australia and the first to leave behind an artefact to record his visit, the Hartog plate. His name is sometimes alternatively spelled Dirck Hartog or Dierick Hartochszch. Ernest Giles referred to him as Theodoric Hartog. 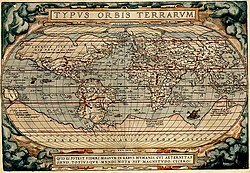 The Waldseemüller map or Universalis Cosmographia is a printed wall map of the world by German cartographer Martin Waldseemüller, originally published in April 1507. It is known as the first map to use the name "America". The name America is placed on what is now called South America on the main map. As explained in Cosmographiae Introductio, the name was bestowed in honor of the Italian Amerigo Vespucci. Hessel Gerritsz was a Dutch engraver, cartographer and publisher. He was one of the notable figures in the Golden Age of Dutch/Netherlandish cartography. Despite strong competition, he is considered by some “unquestionably the chief Dutch cartographer of the 17th century”. La grande isle de Java was, according to Marco Polo, the largest island in the world; his Java Minor was the actual island of Sumatra, which takes its name from the city of Samudera situated on its northern coast.